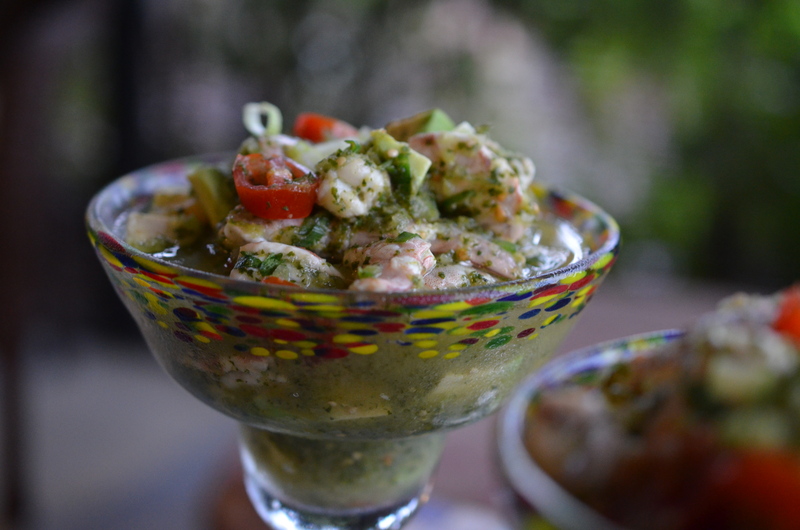 Mexican Shrimp Ceviche- Big Kickin’ Flavor! Hot, sticky Florida days begs for cold, refreshing, light dishes- and of course packed with flavor. 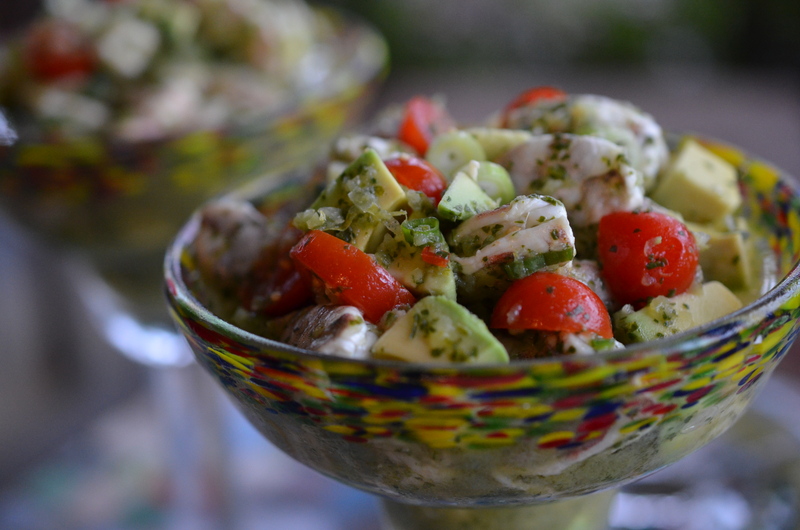 I saw a family a few weeks ago with a gigantic cup of ceviche when we were out to dinner at a local Mexican restaurant and found myself staring with envy. Why didn’t I order that!! I knew it would not be long before it made it onto our table at home! I cannot resist cilantro and lime, they are possibly my favorite flavor combination. I love ceviche with tostones, fried plantains, but my favorite is with sweet potato crisps, the sweetness of the potato is a perfect complement to the spiciness of the ceviche. The recipe I used is from the “King of Mexican Food”, Rick Bayless, and is very spicy, but evened out by the creamy avocado chunks. Cut the shrimp into small pieces—slightly smaller than 1/2 inch—and scoop into a serving bowl. In a blender, combine the lime juice, tomatillos, cilantro and 3/4 teaspoon salt. Blend until slushy looking, but not completely smooth. Stir into the shrimp and refrigerate 30 minutes. Just before serving, stir in the two chiles, chives and avocado. Taste and season with more salt if you think necessary. 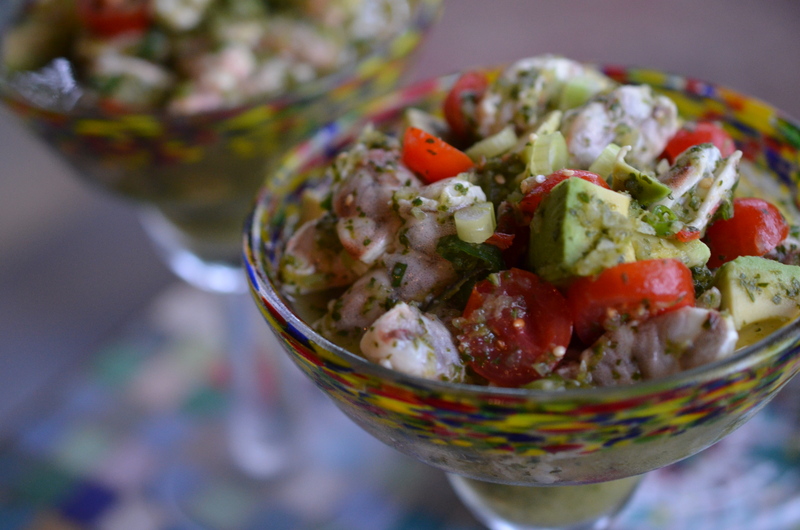 The marinate time is critical in ceviche, especially with shrimp. The citrus will cook the raw seafood, but it can also overcook if left to long, leaving you with rubbery, tough shrimp. I waited an hour before I served it, and was pleased that the shrimp was still tender. If you find yourself worried about overcooking the shrimp, at least strain the marinate, reserving the juice until you are ready to serve. But try to get it on the table as soon as you can. 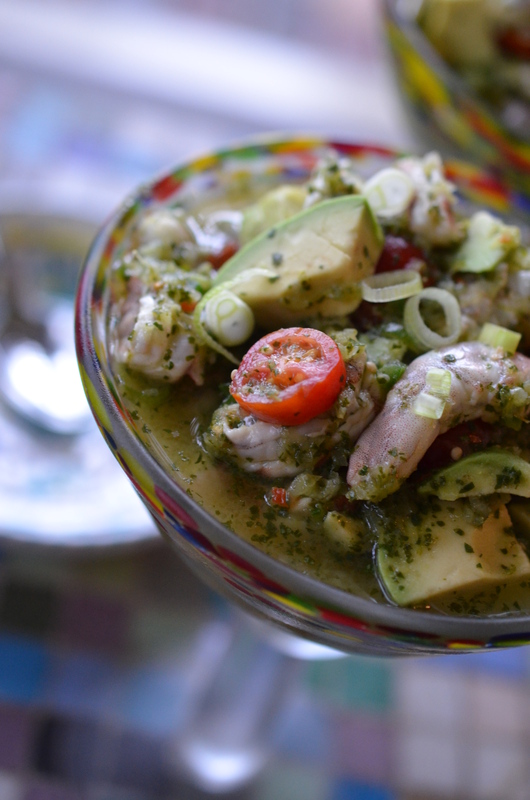 The kick in this ceviche is powerful, yet smooth. If you are not a fan of spice, cut the chilies by ½ and be sure to add right before serving. 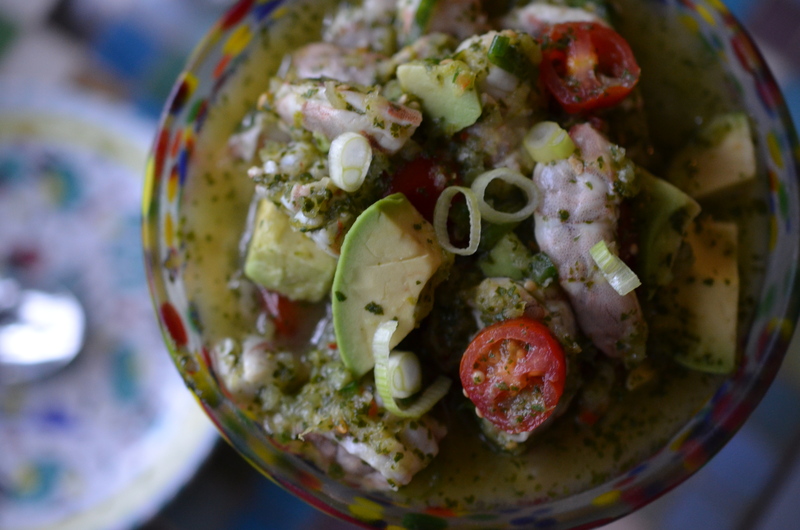 Try serving sweet potato chips, tostones or tortilla chips to along with the ceviche. And of course make sure there are margaritas or cervezas.